Described as “the convergence of the digital and genetics revolutions with health and healthcare," digital health captured over $4 billion in venture capital investment in 2014. A key component of this emerging field is consumer engagement. And given the rate of smartphone adoption, it's no surprise that healthcare organizations are significantly investing in consumer-facing mobile applications. If current trends continue, 65 percent of transactions between healthcare organizations and consumers will be mobile within the next few years. And we can expect to see apps become more sophisticated, evolving from health and fitness trackers to everything from gaming platforms that encourage patients to adhere to their prescriptions to photoplethysmography apps (heart rate monitors) or apps for diagnosing an interesting looking rash. As health and fitness apps become more prevalent, developers and investors alike will want to keep abreast of guidance from the Food and Drug Administration regarding when and how this technology will be regulated. The FDA recognizes that mobile apps have the potential to transform healthcare by allowing doctors to diagnose patients outside of traditional healthcare settings, helping consumers manage their own health and wellness, and granting consumers access to useful information whenever and wherever they need it. Some apps will fall within the definition of a “mobile medical application (MMA)” and will be regulated as medical devices under the Federal Food, Drug, and Cosmetic Act. These are apps that either (1) are used as an accessory to a regulated medical device; or (2) transform a mobile device, such as a smartphone or tablet, into a regulated medical device. The FDA’s guidance on MMAs is risk-based and focused on the categories of apps that pose the greatest risk to patients. The agency has also provided examples of the various categories of apps, including those that it intends to regulate, those that will be subject to enforcement discretion and those that it does not intend to regulate. Perform patient-specific analysis and provide patient-specific diagnosis, or treatment recommendations. In January, the FDA issued draft guidance to clarify which products it will consider to be medical device accessories, and how its risk-based framework will apply to such accessories. This draft guidance will affect MMAs that are used as accessories to regulated medical devices. Examples may include an MMA that controls the inflation and deflation of blood pressure cuffs, one that acts as a wireless remote control for an X-ray machine, or one that controls delivery of insulin via an insulin pump. The draft guidance defines “accessory” as “(a) device that is intended to support, supplement and/or augment the performance of one or more parent devices." It acknowledges that an accessory may not present the same level of risk as the parent medical device, and therefore may not be subject to the same level of regulation as the parent device. It also proposes to determine the regulatory classification of an accessory by evaluating the risks it poses when used as intended with the parent device, as well as any unique risks of the accessory independent of its parent device. Additionally, the draft guidance encourages developers to utilize the de novo classification process to request risk-based classification of new types of accessories. The agency will exercise enforcement discretion regarding apps that may or may not fit the definition of MMA, but pose a low risk to patient safety. Apps that are subject to enforcement discretion include those that help patients self-manage their disease conditions without providing specific treatment suggestions, those that provide tools to track and organize health information and those that help patients document and communicate with their healthcare providers about potential medical conditions. There is, however, a caveat. The intended use of an app determines whether it meets the definition of “device." If the app is intended for diagnosis, cure, mitigation, treatment or prevention of disease, then it will be considered to be a device and will be subject to FDA regulation. Intended use may be determined by a review of labeling claims, advertising materials or oral or written statements by manufacturers or their representatives. Finally, the FDA will not regulate mobile apps that do not fit the definition of MMAs. These include apps that offer general educational tools for practitioners or patients, apps that automate general medical office functions and apps that provide generic tools such as magnification, note-taking, or camera function. These products must be intended only for general wellness use and must present a very low risk to a user’s safety. App developers have a number of things to consider. First, those intending to avoid regulation should carefully consider how they brand and market their apps. The app should not be marketed or branded as being related to diagnosing or treating a specific illness or disease. Rather, the app should be described to the public as being one that promotes a healthy lifestyle generally, or one that promotes healthy lifestyle choices that, in turn, are connected to disease prevention or “living well” with a disease. Under the draft guidance, where a well-known and generally accepted connection exists between certain lifestyle choices and prevention of - or living well with - a certain disease, app developers may refer to such connections in promoting their products. They should be careful, however, not to make claims that are too strong. The difference between “living well” with a disease, which is unregulated, and “treating” a disease, which may be regulated, is ill-defined. While the healthy lifestyle encouraged by using the app may have significant benefits for users inflicted with certain illnesses or diseases, inclusion of specific marketing or promotional materials may trigger regulatory oversight. Second, the draft guidance is silent on the ramifications of third-party characterizations of an app. Consider the emergence of social networks geared toward specific patient populations, such as PatientsLikeMe, or patient communities on mainstream platforms like Facebook. Inevitably, patients who find an app helpful will tout its benefits in their virtual communities, even if the app’s developer never marketed it for a particular disease or illness. At that point, it will only be a matter of time before the developer is asked about the purported benefits. Is the device or application invasive? Does the device or application involve an intervention or technology that may pose a risk to a user’s safety if device controls are not applied, such as risks of lasers, radiation exposure, or implants? Does the device or application raise novel questions of usability? Does the device or application raise questions of biocompability? If the answer to any of these questions is yes, then the app can't be low risk and can't be a “general wellness” product under the draft guidance. Examples of products that do not qualify for regulatory exemption as “general wellness” products include sunlamps for tanning, implants to improve self-esteem and lasers used to improve user appearances. Although a device may be intended for “general wellness” purposes, if it poses a risk to a user, such as potential increase in cancer or complications from being implanted into a user’s body, it will be regulated. The agency’s list of questions poses some potential problems for app developers. In particular, what exactly is a novel question of usability? As technology continues to advance and offer new opportunities for health-related applications, does the use of such new technology pose a novel question of usability? Or will the FDA consider this the equivalent of simply looking at a known use under a new light or at new angle? According to the FDA, a “general wellness” product is either (1) one that is intended to maintain or encourage a general state of health or healthy activity; or (2) one that is intended to associate the role of a healthy lifestyle with helping to reduce the risk or impact of certain chronic diseases or conditions, where it is well understood and accepted that healthy lifestyle choices may play an important role in health outcomes for that disease or condition. If the product’s intended uses are not limited in this fashion, then the product does not fall within the “general wellness” sphere. Apps that monitor and record food consumption to manage dietary activities for weight management. For the second category, the FDA identified two subgroups. Products fall within this second category if they are intended to promote, track and/or encourage choices that may help to (1) reduce the risk of; or (2) help live well with certain chronic diseases or conditions. Apps that track sleep patterns and promote healthy sleep habits which, as part of a healthy lifestyle, may help reduce the risk for developing type 2 diabetes. The agency has stressed that any claim should only include references where it is widely understood and accepted that healthy lifestyle choices reduce the risk or impact of the chronic illness or disease. A “widely accepted understanding” may be demonstrated through peer-reviewed scientific literature supporting the claim. App developers must consider what qualifies as a chronic illness or disease. They must also be prepared to explain why it is “widely understood” that certain actions reduce specific risks (even though the agency has not clarified which community or communities should possess the “understanding”), which types of peer-reviewed scientific literature are acceptable for support, and the timeframe within which the lifestyle “choice” must be deemed acceptable and beneficial to health. After all, views change over time. It's a good bet, though, that the further afield the literature is from mainstream medical journals, the greater the risk is that the agency will find a reason to reject arguments of a “wide understanding.” The safest course of action for an app developer is to monitor the current research on lifestyle choices implicated by the app. Although this second category provides the ability to link a general wellness app to certain chronic illnesses, developers desiring to remain off the FDA’s radar are likely better off if they do not articulate a connection between the health benefits and patients with specific illnesses. 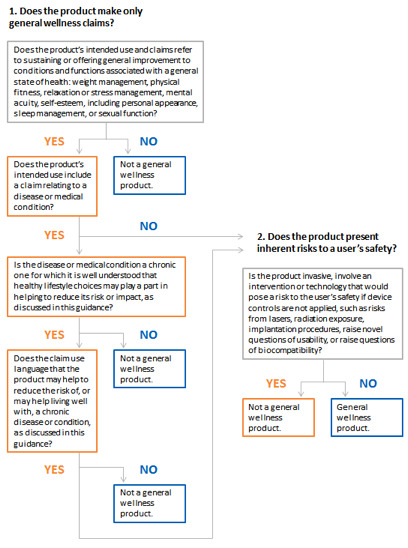 Ultimately, though questions will still arise, the agency’s draft guidance on “general wellness” products, including the examples, is helpful in determining whether the FDA will regulate an app. If nothing else, the draft guidance provides a welcomed starting point for App developers to begin a discussion with the FDA.